After leaving Llandovery riders will head into Crychan Forest after a steady road climb. The route includes plenty of excellent riding, but cuts out a few big climbs from the longer route. The routes split and rejoin within Crychan after 14km. After leaving Crychan and a short road section there is one final big climb, before the final descent that is the same as previous years, plummeting riders down on a fast, fun descent with just the final kilometre back on roads to the event HQ. There will be one feed station, approximately 20km distance. If 40km isn’t enough for you, then we have the 54km route which has 1300m of climbing. The longer route splits from the shorter route at the 14km marker. After a steady road climb to begin the route heads into Crychan Forest for a big section that is completely off the roads. The hills are fairly frequent with a mix of longer but shallower climbs and a few steeper hills. 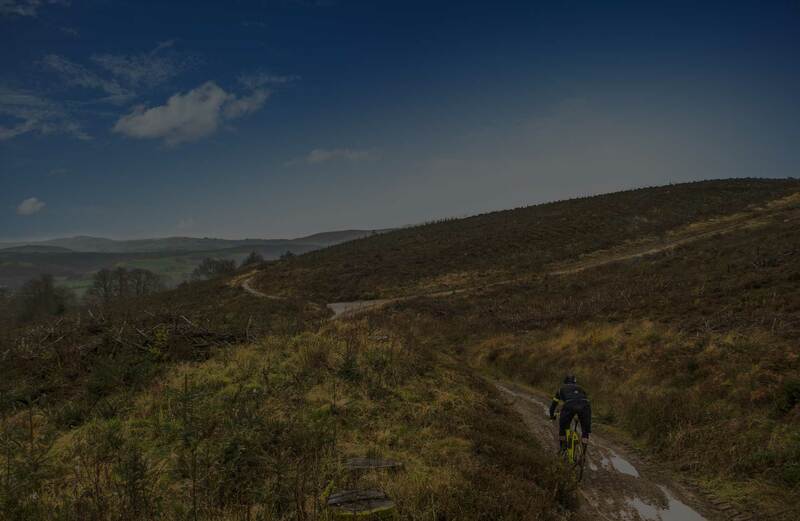 There will be at least 3 different technical lines, meaning for those who are riding MTBs or fancy testing their skills on a CX bike there are plenty of places to do that. The final section remains the same as previous years with a fun, fast descent that has become a feature of the event..
A total of 2 feed stations, approximately – 20km & 40km distances. 1Can I enter on the day? Sorry, entry is only available in advance. Entries for the 2018 event close on Sunday October 21st. Anything capable of riding off-road is suitable. The terrain is varied and suits Cyclocross bikes and Mountain Bikes and some gravel bikes. If you want to ride a CX/gravel bike then we recommend disk brakes, tubeless tyres, decent tread on the tyres for grip and also as fat as possible. We suggest 40mm as a minimum, but less is possible. 3Can I use an e-bike? "Riders are not permitted to take part in any non-competitive event unless the rider would be unable to take part otherwise"
This is guidance for all legal e-bikes. Any e-bikes that have been de-restricted are banned completely. We are unable to refund entries, but we will allow transfer of names. If you can’t make it, but want to sell/give your entry to someone else, that is fine with us. Name transfers will be free of charge up until 21 days before the event. Beyond this date it may not be possible to transfer entries. Entry transfers can be to different categories if required. 5What is the lower age limit? There is no lower age limit, but have the following rules: Under 16's - Must ride with a parent/guardian at all times & have written consent. 16-17 - Can ride alone, but must have written consent from a parent/guardian and understanding of the nature of the event. 6Do I need a racing license? No. The event is classed as non-competitive, as such no racing license is required. No ranking points or prizes are on offer. 7Is there a cut off time? Yes, we will inform riders nearer the time what the cut-off is likely to be. It will depend on weather and ground conditions. 8If I enter the long route, can I switch on the day? Yes, you are free to change distance on the day - either before the start or during the ride. 9I've entered the short route, but fancy doing the longer route? We would prefer it if you can let us know at least a week before the start - but if you want to do the longer route, you can free to change. We will be using a computerised timing system. It does not use timing chips, but will give you an accurate time for the route.